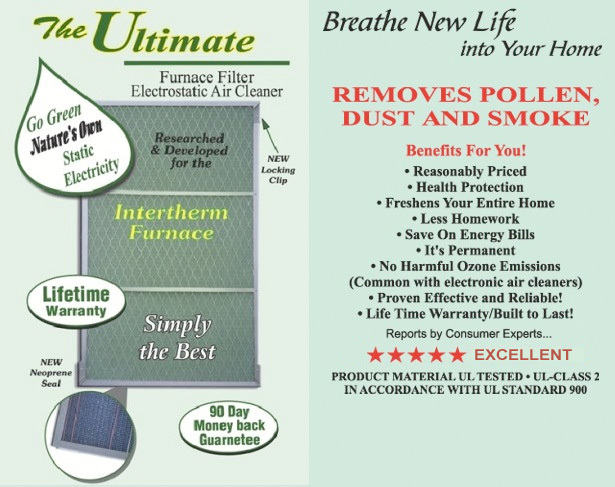 Intertherm Furnace Filter | Ultimate Vent Inc. The Intertherm Furnace Filter harnesses nature’s own static electricity to effectively clean the air in your entire home. a unique design of differing static prone polymer materials form a very effective six stage air cleaning process. The friction of air flowing through these space age materials intensifies a permanent static charge, positive or negative. As airborne particles interact and collide with this electrostatic gradient, attractive and repulsive magnetic forces act to slow down and trap most particles like iron filings to a magnet. for replacement for the Intertherm furnace only. The Ultimate Electrostatic Air Cleaner harnesses nature’s own static electricity to effectively clean the air in your entire home. 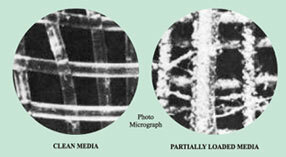 a unique design of differing static prone polymer materials form a very effective six stage air cleaning process. The friction of air flowing through these space age materials intensifies a permanent static charge, positive or negative. As airborne particles interact and collide with this electrostatic gradient, attractive and repulsive magnetic forces act to slow down and trap most particles like iron filings to a magnet. The Ultimate incorporates a unique tubular weave of electrostatic media on its prefilter side. This creates negatively charged pockets or agglomeration chambers which trap small dust particles charging them negativley. These chambers in combination with a grid of positively charged high density co-polymer rods act to give The Ultimate Filter dramatically better cleaning effeciency on small dust particles. The Ultimate Filter has been tested by Air Filter Testing Laboratory according to the American Society of Heating, Refrigeration and Air Conditioning Engineers (ASHRAE) standard 52-76 protocol. The certified results of the ASHRAE dust arrestance test show that 93% arrestance effeciency. Are you looking for the Ultimate Vent? You can shop using our online store, call us toll-free at 1-800-313-6223 or, to purchase in person, find a store location. Your Home constantly receives "fresh air" that enters your home though a furnace fresh air intake vent mounted on the exterior wall of your house, that has little or no protection for you and your family from dust, allergens, airborne bacteria, Insects, and other contaminants. Or contact us online by clicking here.